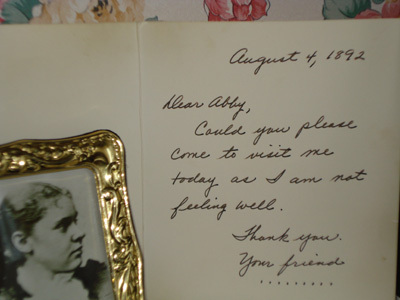 On the advice of their attorney, Emma and Lizzie offered a reward of $500 for the writer of the note, the person who was “sick in town”, or the boy who delivered the note telling Abby she was needed on the morning of August 4, 1892. Nobody ever came forward to claim the small 1892 fortune. When the Lizzie Borden B&B opened, the missing note was soon placed on the sitting room mantel by Sally McGinn which is still there to this day as a lucky talisman for the house.